Ice wine (or icewine, as one word, or in German, Eiswein) is a type of dessert wine produced from grapes that have been frozen while still on the vine. The sugars and other dissolved solids do not freeze, but the water does, allowing a more concentrated grape must to be pressed from the frozen grapes, resulting in a smaller amount of more concentrated, very sweet wine. With ice wines, the freezing happens before the fermentation, not afterwards. Unlike the grapes from which other dessert wines, such as Sauternes, Tokaji, or Trockenbeerenauslese, are made, ice wine grapes should not be affected by Botrytis cinerea or noble rot, at least not to any great degree. Only healthy grapes keep in good shape until the opportunity arises for an ice wine harvest, which in extreme cases can occur after the New Year, on a northern hemisphere calendar. This gives ice wine its characteristic refreshing sweetness balanced by high acidity. Due to the labour-intense and risky production process resulting in relatively small amounts of wine, ice wines are generally quite expensive. Left: The first ice wine produced by Inniskillin, a 1984 Vidal, was in fact labelled "Eiswein". The most famous (and expensive) ice wines are German Eiswein and Canadian Icewine (where the name is written as one word), but ice wine is also made in Australia, Austria, Croatia, Czech Republic, France, Hong Kong, Hungary, Israel, Italy, Luxembourg, New Zealand, Slovakia, Slovenia, Sweden and United States, at least in smaller quantity. In contrast to most other wine-producing regions, Canada, particularly the Niagara Peninsula, consistently undergoes freezing in winter and has become the world's largest ice wine producer. Inniskillin Wines is considered the most widely known Canadian icewine producer as the first Canadian winery to win a major international award, the Grand Prix d’Honneur at 1991 Vinexpo in France, with their 1989 Vidal Icewine. 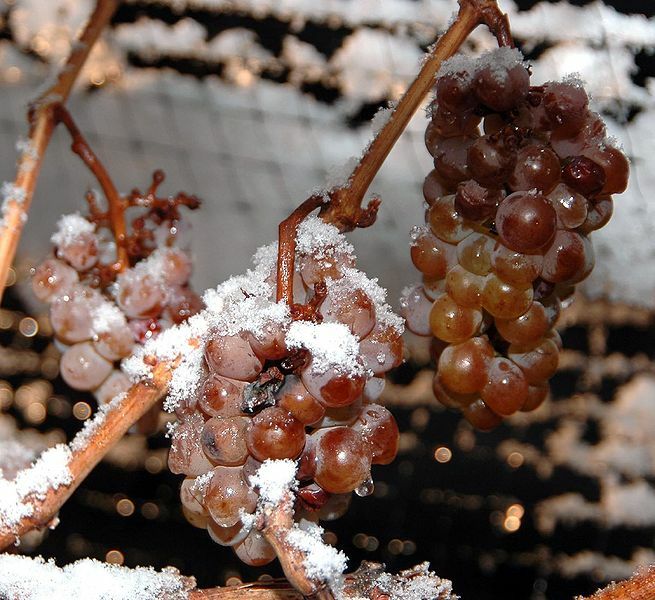 Natural ice wines require a hard freeze (by law in Canada −8 °C (17 °F) or colder, and in Germany −7 °C (19 °F) or colder), to occur sometime after the grapes are ripe, which means that the grapes may hang on the vine for several months following the normal harvest. If a freeze does not come quickly enough, the grapes may rot and the crop will be lost. If the freeze is too severe, no juice can be extracted. The longer the harvest is delayed, the more fruit will be lost to wild animals and dropped fruit. Since the fruit must be pressed while it is still frozen, pickers often must work at night or very early in the morning, harvesting the grapes within a few hours, while cellar workers must work in unheated spaces. The high sugar level in the must leads to a slower-than-normal fermentation. It may take months to complete the fermentation (compared to days or weeks for regular wines) and special strains of yeasts should be used. Because of the lower yield of grape musts and the difficulty of processing, ice wines are significantly more expensive than table wines. They are often sold in half-bottle volume (375 ml) or the even smaller 200ml bottle. Left: Grapes for ice wine, still frozen on the vine. Typical grapes used for ice wine production are Riesling, considered to be the most noble variety by German winemakers; Vidal, highly popular in British Columbia and Ontario, Canada; and, interestingly, the red grape Cabernet Franc. Many vintners, especially from the New World, are experimenting with making ice wine from other varieties: whites such as Seyval Blanc, Chardonnay, Kerner, Gewürztraminer, Chenin Blanc, Pinot Blanc, and Ehrenfelser; or reds such as Merlot, Pinot Noir, and even Cabernet Sauvignon. Ice wines from white varieties tend to be pale yellow or light gold in color when they are young and can maderise (acquiring a deep amber-golden color) as they age. The red varieties tend to have a light burgundy or even pink color like that of rosé wines. Ice wine is very refreshing (as opposed to cloying) due to high acidity. Ice wine usually has a medium to full body, with a long lingering finish. The nose is usually reminiscent of peach, pear, dried apricot, honey, citrus, figs, caramel, green apple, etc., depending on the varietal. The aroma of tropical and exotic fruits such as pineapple, mango, or lychee is quite common, especially on white varietals. Ice wine usually has a slightly lower alcohol content than regular table wine. Some Riesling ice wines from Germany have an alcohol content as low as 6%. Ice wines produced in Canada usually have higher alcohol content, between eight and 13 percent. Connoisseurs argue about whether ice wine improves with age or is meant to be drunk young. Those who support aging claim that ice wine's very high sugar level and high acidity preserve the content for many years after bottling. Those who disagree contend that as ice wine ages it loses its distinctive acidity, fruitiness, aroma, and freshness.